OK, so why does this look so bad for the coast? At least as of now? "snow will accumulate for a good portion of the forecast area for a good part of the day. 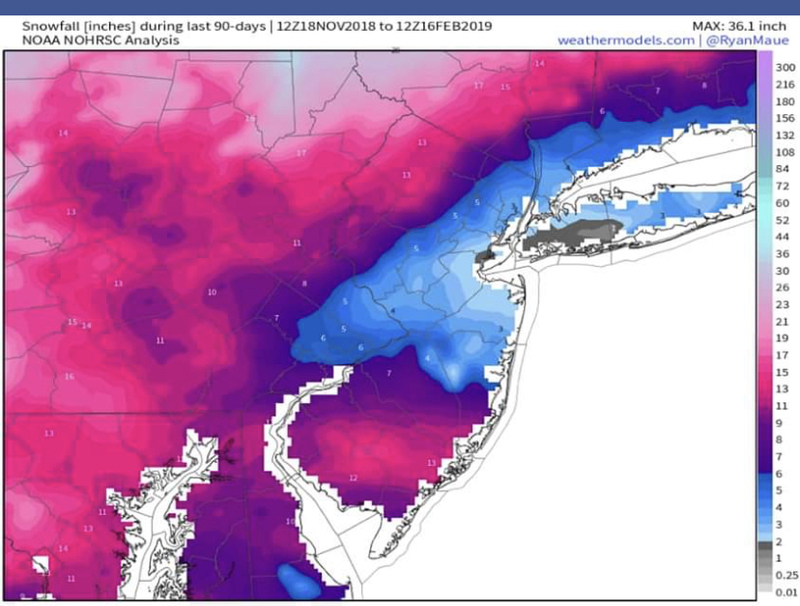 Midlevel warm air starts to lift into far southern portions late in the afternoon, allowing for a wintry mix over southern Delmarva and southeast New Jersey, but surface midlevel temps remain cold enough for all snow across the southern Poconos, northern NJ, and down into the Delaware Valley." "Winds turning onshore should usher warmer and above freezing temperatures to these coastal areas earlier than inland locales." The snow arrives at the same time as the warm air for the Shore. It looks like the warm air might even beat the snow outright for NENJ and NYC. So, if this happens, we are all DOA, no? And compare the placement of the Highs on the Nam and the GFS as the precip is approaching. On the Nam the high literally jumps from Lake George to South Philly. Whereas the GFS keeps the high at bm and then ots. And it's the high pressure that keeps the cold air in place, right? so this makes sense now why the Nam is showing a colder solution, the high pressure is in the perfect spot on the Nam to create several more hours of thump from Ocean County on up to really Nassau County. So, if the Nam happens, different story. But the only one buying the Nam right now is the Nam...lol. Is that right in any way? by the way, if all this is just wrong, sorry! lol. Seems like it makes sense...as I look at it anyway. Tonight’s event favors SNE for the heaviest snows and Wednesday favors Southern PA/NJ lol. The NYC snow hole lives on! The biggest snow hole in the northeast this year is easily B oston down I95 through NYC and most of CNJ and SNJ. The big winner, or loser, depending on how you look at it is definitely B oston right now. They've had only 4.8 inches of snow since October 1. Yeah, but they’ll be ahead of us after tonight. So frustrating the best action remains either north or south of NYC. It didn't quite happen but B0ston did have their biggest snowfall of the season today at 3.4 inches. It now brings them to 8.2 inches for the season with the bulk of it, 5.8 inches, all in February. 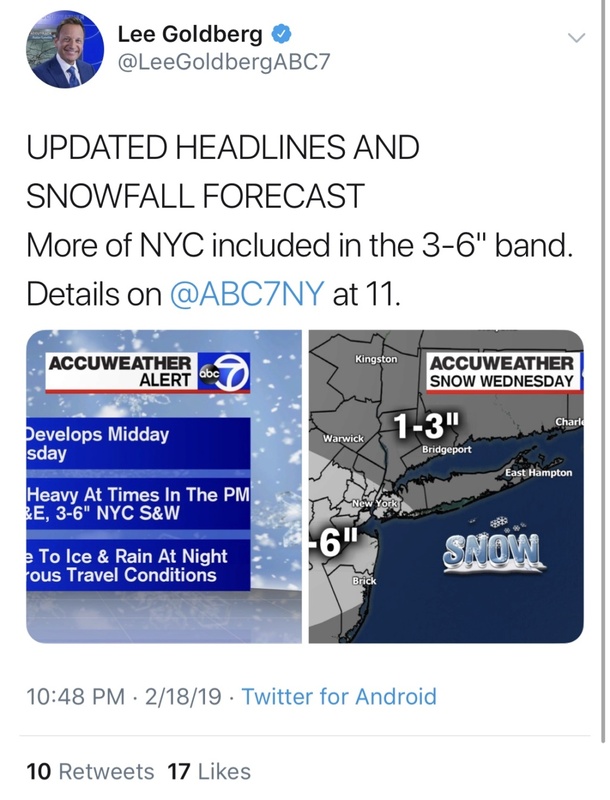 NYC remains at 8.7 inches, a mere 0.5 inches ahead now from the city to the northeast. It's close but both places are big losers this year and the trend looks to continue on Wednesday for both cities. SENJsnowman wrote: OK, so why does this look so bad for the coast? At least as of now? 2. It’s understood that the high pressure will be the mechanism responsible for providing the cold air at the onset, but how/why does it do this? Hyde I ended up with less then an inch. I too agree SENJSnowman. You are nailing the this analysis. VERY Well done. I will let you answer rb's questions, but a hint would be follow the wake of the confluence at 500mb to help you answer the question as to why the HP provides the cold air at the onset. But also to help you answer which model you believe is correct. Ultimately where the HP shifts and is centered plays a huge role in determining the timing to the warming of the midlevels. Two words: source region. Why does the HP, which starts out in perfect position, instead of lifting out to the NE, shifts east and even SE instead? Again Follow the confluence. The HP builds in the wake of the confluence. CNJ and PHI are in a prime spot for this storm IMO. Good work SE NJ on the maps and discussion. GEM LAM goes bezerk this run with many LP and HPS LOL. Ray, I'm working on #1 next, but I gotta clock in for a few hours tonight, so I hope to get back to this one later. 2. High pressure areas in northern latitudes in the winter time are typically associated with arctic air masses. When the high pressure area meets the low pressure area, the colder air from the high sinks toward the surface (warming a bit as it does) and the warmer air from the low rises to the top (cooling and also saturating the air column as it does). So the warmer low pressure air closer to the surface is literally replaced with the colder sinking air. Meantime, what about my #2? I can take it...give it to me straight rb! Thanks SROC...I look forward to trying to work thru your issues/questions tonight and see if I can weigh in! I’d love to buy into the NAM as it gives me a 3-6” snow event and it did handle last Tuesday well. But I don’t. It’s placement of the High Pressure center is the first clue to me something is amiss. Interesting thing about this event is that the timing is much more similar to the November event which is problematic for commuters. Nobody is going to close Wednesday for a storm not expected to start until afternoon. But, if it does start snowing heavily around 2 or 3 pm, people could be caught in the same traffic nightmare as November on their way home. 0z NAM holds serve. Still showing extended snow and sleet with pretty much a general statewide 3-6”. Interestingly the 0z NAM now places the High off New England, which is more consistent with GFS (and logical). I still don’t think that’s a great spot for it to keep cold air in place; but I guess I could be wrong. SENJsnowman wrote: Ray, I'm working on #1 next, but I gotta clock in for a few hours tonight, so I hope to get back to this one later. "High pressure areas in northern latitudes in the winter time are typically associated with arctic air masses." YES. And even during the warm season, these high pressures are typically associated with cooler air relative to that further south. Same concept. "When the high pressure area meets the low pressure area, the colder air from the high sinks toward the surface (warming a bit as it does) and the warmer air from the low rises to the top (cooling and also saturating the air column as it does). So the warmer low pressure air closer to the surface is literally replaced with the colder sinking air." You've just described one of the fundamentals of Meteorology: The Law of Conservation of Mass. Let's now take this a step further, though. WHY is the flow of air directed from the cooler high to the "warmer" low? It's all about density. Cooler/colder (and therefore also drier) air is much more dense than warmer/hotter (and therefore more moisture-laden) air, and it is this density GRADIENT that determines the direction in which the colder air will "flow". The direction of "flow" will always act perpendicularly to this gradient. *Keep in mind that this is NOT necessarily the same as the actual wind direction*, though in some cases, like the one coming up, it can be. This is a separate and fairly abstract idea to comprehend, but it gives you an idea of how the cold air will tend to behave independently of its surrounding environment. This is known as the ageostrophic component (technically isallobaric because we are discussing it in terms of the pressure field, not heights) of the lower-level flow, and it must be considered independently of the actual wind direction. billg315 wrote: Interestingly the 0z NAM now places the High off New England, which is more consistent with GFS (and logical). I still don’t think that’s a great spot for it to keep cold air in place; but I guess I could be wrong. Lee wth?? Is he smoking the cannibas? That precip has to.move in by 1-2pm and snow till 5-6 and then transition to sleet, sleet ratio is 3:1 at best. Is it possible, possible but the trends and the players positions as proggged don't show this. Zoo and I in NENJ see about 1-2" most. What we'd need is the HP to track NE not E or SE. 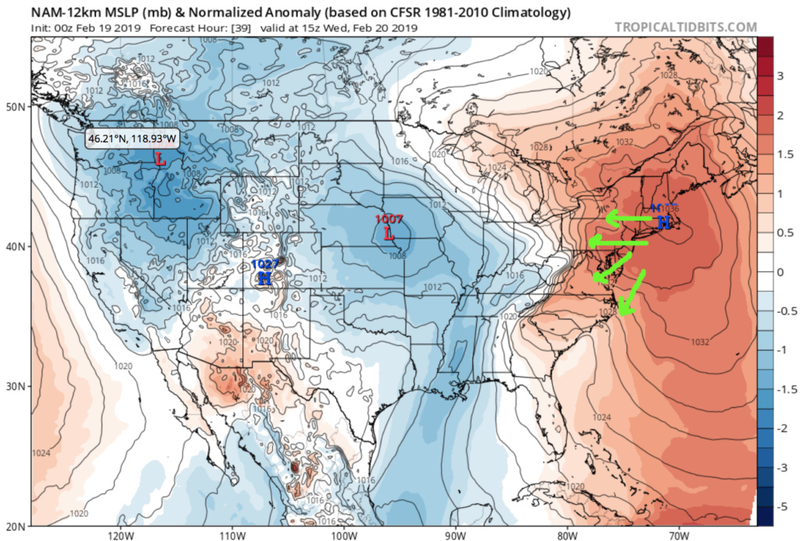 CNJ to PHI again do best for our area overall unless we see a sizable shift in the HP or the speed of the precip. Very Nina like type storm or warm neutral Nino which we have been and are in. At the moment, I am seeing a setup similar to the system from last week. Maybe an hour or two of snow for NYC, then a prolonged period of sleet. Of course, the wild card is how long can the upper levels stay cold all the way through. During the November 15th event, they stayed cold for five hours, more than enough to wreak havoc on the evening commute. The precipitation from this event may actually start around the same time as that November event. But given the overall pattern over the past three months, there's every reason to be skeptical about 3-6" of snow in NYC. SoulSingMG wrote: Lee's feeling bullish! This is what I have felt for a few days. DC will be too warm at midlevels and will mix too quickly. Above nyc will not be heavy enough rates. Phl-nyc special with Monmouth county finally getting a taste sounds about right. I hope Mom sees this she had two fingers on the towel yesterday,LOL.Central and Central Shore NJ folks really deserve this one, they have done really bad this season.good luck everybody there! The stubborn GFS is slowly pushing the snow further northeast at 6Z run. I think it’ll come around sometime before 0 hour. Just to give you an idea of just how bad us along the coastal plain have done check this image out. Nov18-Feb16th. Ugg! Ugly map Doc and sorry it had to happen this season.It's a throwback to a time when "areas N and W of the City" getting more snow was a constant mantra of TV and radio newscasting of the weather. OK, sroc, gonna do my best here. I'm sure I'll have some gaps and errors, but I think I understand the basics and how it applies in the case. Wake: the vortex that's created as a moving force leaves an area. It looks to me like the cold Canada air is going straight for the HP center. That HP is too far north though, so the really cold air stays well above us. It looks like most of the 500mb air flow that comes over our area is actually warm source air that travels north from the Gulf to the midwest and then over to us. 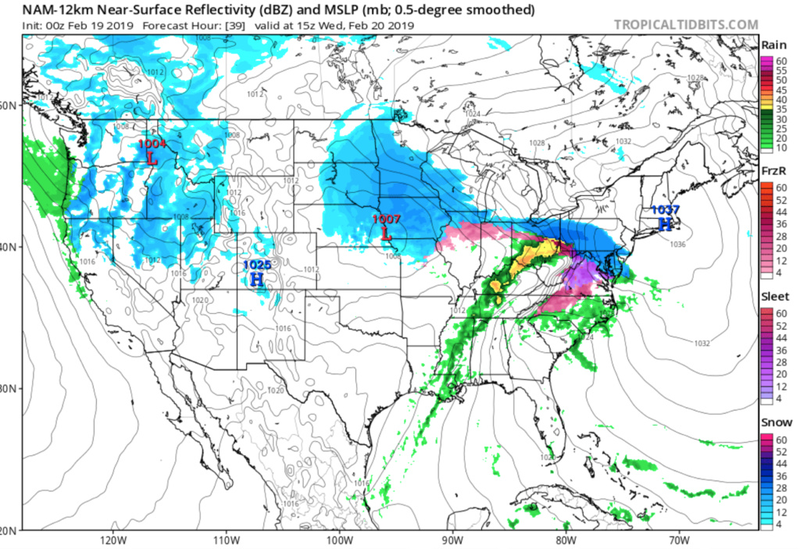 The Nam looks only slightly different, but that slight difference looks important. The more southern placement of the HP seems to bring the arctic air much further south. But still not south enough. And we still get overrun by the abundance of warm gulf air being brought up by the storm system. And in both cases confluence is E or SE. No where close to N or NE. So based on that analysis, this storm should track SE, which will help pull more cold air into our region. Or closer into our region anyway. But there will always be a direct flow of warmer gulf air coming directly over the top of us. So would the result be something like this in that case? That outcome puts our area largely on the border of the cold, and would create a nowcast situation? rb is the hi pressure to lo pressure movement of air what causes the onshore wind? The offshore placement of the high due east from the low means an easterly flow? if this is a "no no" then let me know moderators and I'll remove it. But i believe this is close to what will occur on this and someone gets 6".